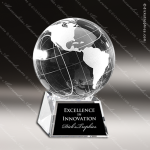 A Stunning Frosted World Globe Crystal Award with Clear Crystal Base. Personalized with the message of your choice, it will surely become a treasured keepsake for the recipient. Imagine the expression of the person when they see their name on one of these impressive awards. Engraving is laser etched and a velvet lined presentation gift box is included. A Clear Crystal World Globe on Sculpted Prism Pedestal and Clear Crystal Base. Personalized with the message of your choice, it will surely become a treasured keepsake for the recipient. Imagine the expression of the person when they see their name on one of these impressive awards. Engraving is laser etched and a velvet lined presentation gift box is included. A Crystal Desk Name Plate Resting on a Clear Crystal Base with Gold Trim. Personalized with the message of your choice, it will surely become a treasured keepsake for the recipient. Imagine the expression of the person when they see their name on one of these impressive awards. Engraving is laser etched and a velvet lined presentation gift box is included. 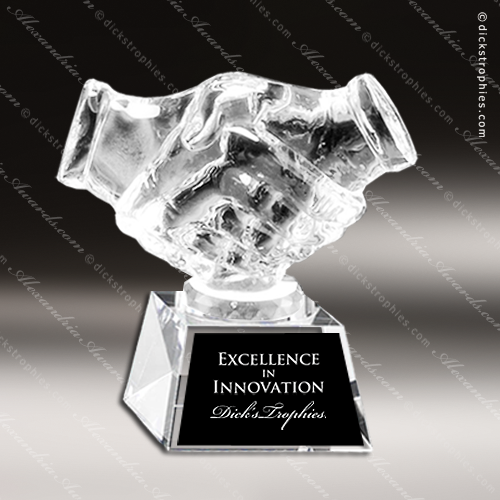 An Elegant Clear Crystal Hand Shake Award on Clear Crystal Base. Personalized with the message of your choice, it will surely become a treasured keepsake for the recipient. Imagine the expression of the person when they see their name on one of these impressive awards. Engraving is laser etched and a velvet lined presentation gift box is included. An Elegant Clear Crystal Heart Trophy Award. Personalized with the message of your choice, it will surely become a treasured keepsake for the recipient. Imagine the expression of the person when they see their name on one of these impressive awards. Engraving is laser etched and a velvet lined presentation gift box is included. An Elegant Crystal Horizontal Rectangle Trophy Award Desk Set with Beautiful Crystal Panel. Personalized with the message of your choice, it will surely become a treasured keepsake for the recipient. Imagine the expression of the person when they see their name on one of these impressive awards. Engraving is laser etched and a velvet lined presentation gift box is included. A Corporate Crystal Horizontal Rectangle Trophy Award on Crystal Base. Personalized with the message of your choice, it will surely become a treasured keepsake for the recipient. Imagine the expression of the person when they see their name on one of these impressive awards. Engraving is laser etched and a velvet lined presentation gift box is included. 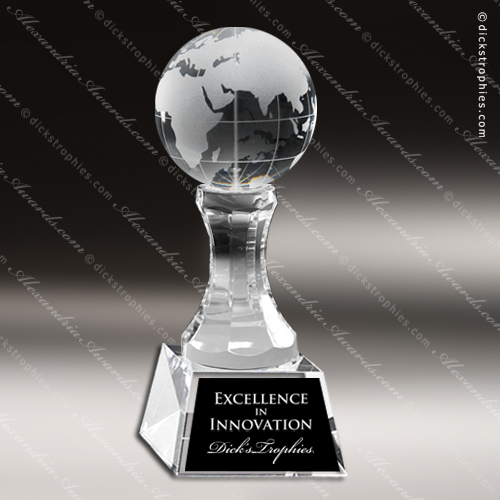 These Corporate Crystal Ice Flow awards are ideal to recognize the ultimate in achievement. Boasting a 1" thick body and a unique cut pattern that gives this crystal award the appearance of an ice flow adds another dimension to these awards. Engraving is laser etched and a velvet lined presentation gift box is included. A Beautiful Clear Crystal Looking Glass Beveled Dome Award makes an excellent employee recognition award, achievement award, sales award or customer appreciation award. Personalized with the message of your choice, it will surely become a treasured keepsake for the recipient. Imagine the expression of the person when they see their name on one of these impressive awards. Engraving is laser etched and a velvet lined presentation gift box is included. An Elegant Millennium Crystal Award with Plenty of Room for Engraving. Personalized with the message of your choice, it will surely become a treasured keepsake for the recipient. Imagine the expression of the person when they see their name on one of these impressive awards. Engraving is laser etched and a velvet lined presentation gift box is included.